This year’s Rio Tinto AGM was extraordinary for one particular reason: Indigenous representatives had travelled all the way from Alaska to THANK the company – for pulling out of a project that would have wrecked their lands and livelihoods. London-based Anglo American pulled out of this ill-conceived and hugely unpopular project last year. Now Rio Tinto has followed suit – and thereby probably killed the project. Let’s hope so, anyway. I think that our own thanks are due not to Rio Tinto but to Indigenous campaigners like Bobby Andrew and Kimberly Williams, who were at this year’s AGM, for the strength and tenacity of their well-organised, well-executed campaign. They give hope to all the other communities trying to keep Rio Tinto off their land or get justice for damage already done. Victory is possible! Thanks are also due to the communities’ allies in Earthworks and the Natural Resources Defense Council, who put considerable resources behind the communities’ struggle to maintain the integrity of the area’s ecosystems and traditional ways of life. But the rest of us haven’t got a lot to thank Rio Tinto for – though to give credit where it’s due, company Chairman Jan du Plessis really does give the company’s critics the opportunity to speak, to make our points. He says he respects us, and if allowing us air time in the AGM is a mark of respect, well, what he says is true. The problem is the difference between the company’s demeanour in London and its operations on the ground. Perle Zafinandro from community organisation FAGNOMBA in Madagascar observed that the introductory presentations had suggested that everything was going well, but that in Madagascar that was far from the case. The company’s QMM subsidiary is exploiting ilmenite at Fort Dauphin. Perle said that QMM has taken more land than it said it would in the beginning and caused environmental destruction. The company seemed to think that the issue of compensation for land was closed now, but that’s not what local people think, and they are not happy. If shareholders want a return on their investment, they had better invest money in a way that does not alienate affected communities. The company has more to gain from settling grievances than from ignoring them. And why is the Government of Madagascar only receiving royalties of 2% when other African Governments receive rates around 12%? The response did at least include an admission that the company’s communication with local communities has left a lot to be desired, and an apology from Rio Tinto Chief Executive Sam Walsh for the company’s failures in that regard. But Rio Tinto still seems complacent about environmental damage and its plans for rehabilitation, and hides behind the Madagascan government over the issue of its derisory royalty levels – as if the industry isn’t engaged in a constant battle with governments to enusre the lowest taxes possible. Both Kemal Ozkan of global mining union IndustriALL and Andrew Hickman of LMN member group Down to Earth spoke about the company’s involvement in the appallingly destructive Grasberg copper and gold mine in Indonesian-occupied West Papua. Here is a mine constructed against the will of local Indigenous Peoples, on a site sacred to them, a mine protected by Indonesian military forces accused of repeated and serious violations of human rights, and which dumps mine wastes straight into the local river system, killing off an entire riverine ecosystem and wrecking local people’s livelihoods. Thirty-three workers were killed in the Grasberg mine over the past year. The Board deeply regretted this as an indescribable tragedy, but attempted to minimise its responsibility by saying that the mine is operated by Freeport, not by Rio Tinto. (It’s not us what did it, guv’nor.) But for Kemal it is part of a pattern of Rio Tinto’s abuse of workers’ collective rights and for Andrew it is part and parcel of the mine’s history of violence, military repression of the Papuan independence movement and abuse of Indigenous People’s rights. Andrew pointed out that three national government pension funds – the Norwegian, Swedish and New Zealand sovereign funds – had disinvested from the mine. The International Finance Corporation had said that its tailings (waste) disposal system was not in accordance with IFC standards. He called for the company to pull out of the mine immediately. The company response was that they were improving things at Grasberg. Roger Moody of Partizans pointed out they have been saying this for the past 15 years, without doing it. The Chairman said that things would be worse if they were not involved. Actually, if they hadn’t been involved, the mine probably would not have grown as big as it has. Kemal pointed out that global mining union IndustriALL is campaigning against Rio Tinto because of its attacks on the collective rights of workers and its failures in health and safety. IndustriALL had that very morning published a report critiquing the company’s operations. Veronique Roche of French trade union CFE accused the company of attacks on jobs at its operations in Europe. Roger Moody spoke about a study published the day before the AGM by Earthlife Namibia about the health impacts of uranium mining at the company’s Rossing mine on Namibian mine workers. The study found that many were suffering severe health problems and called for a full epidemiological study and for full access by workers to their company health records. Jan du Plessis and Sam Walsh agreed to read the study and claimed that workers do now have access to their health records. Roger Featherstone, Director of the Arizona Mining Reform Coalition, called for Rio Tinto to follow its welcome withdrawal from the Pebble Mine project in Alaska with withdrawal from Resolution Copper’s Oak Flat project in Arizona. Here is another utterly ill conceived project, which Rio Tinto controls (and the minority shareholder is that other massive London-listed multinational miner, BHP Billiton). It envisages digging out a cubic mile of copper ore underneath a fertile plateau in arid Arizona in such a way that the surface may collapse several hundred feet. The area is heavily used for recreation and is sacred to the San Carlos Apache and Yavapai Indigenous Peoples. The project is opposed by Native American tribes across the United States, and to get their hands on it Rio Tinto has unsuccessfully attempted eleven times to get public land privatised in a ‘land swap’ which would give it access to an area set aside by President Eisenhower in the 1950s specifically to protect it from mining. Instead of getting the message and leaving, Rio Tinto is making a twelfth attempt to get the US Congress to privatise the land. The company is very eager to ‘dialogue’ with the project’s opponents, to ‘engage’ with them. But what’s the point of dialogue with the company when you’ve made it clear you don’t want the project there at all? Rio Tinto’s response to the clear rejection of its proposals by Native Americans because of the sanctity of the site is to go looking for those few local Native Americans who do not go along with Indigenous tradition and for one reason or another do not mind if the site gets mined. This truly makes a mockery of the company’s purported respect for Indigenous rights. Andy Whitmore, of Indigenous Peoples Links, spoke about recent radioactive spills at the Ranger uranium mine at Kakadu in Australia, run by Rio Tinto subsidiary ERA. There have been repeated safety incidents, the more recent a burst leach tank which spilled over one million litres of radioactive sludge in December 2013. The company wants to extend the life of the mine by pursuing its underground ‘Ranger 3 Deeps’ project, which sounds spooky enough anyway, like a scary trip into the abyss, but now it seems to be saying, well, unless local Aboriginal landholders (whose consent for mine expansion is needed) allow us to go ahead with this, we won’t have enough money to clear up the mess we’ve already made. So local Aboriginal People are being told, you’re damned if you do and you’re damned if you don’t. Would Rio Tinto guarantee funds for the cleanup? And the comforting answer from Sam Walsh was that ERA is a publicly listed Australian company (yes, but YOU control it…) and it’s for ERA to deal with this one. No guarantees from us! Partizans supporter and AGM veteran Albert Beale was concerned about the election of Anne Lauvergeon as a new director. He pointed out that when she was in charge of French uranium company Areva she had finished her term of office with the company making catastrophic losses and mired in a corruption scandal over mine purchases in Namibia. Was she really the best person to improve the image of Rio Tinto? The Chairman replied that Rio Tinto has a rigorous process for appointing directors, doing interviews, checking background and references. Ms Lauvergeon herself blamed Areva’s losses on the 2008 financial crisis. Neither of them said anything about the corruption. Perhaps from their point of view, the less said, the better. In answering Roger Moody’s point about Rossing mine workers, Jan du Plessis said it would have been helpful if he had seen the Earthlife report in advance, as it is difficult to comment on matters of which you are unaware – a fair point, though in this case the report had only just been published and Roger himself had only just had the chance to read and evaluate it. 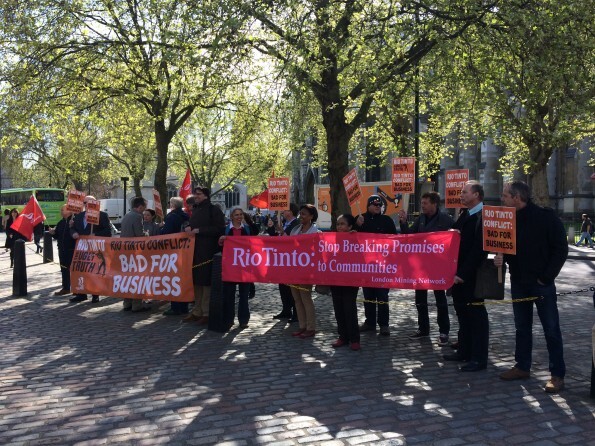 Mr du Plessis pointed out – with good reason – that he had always shown respect for campaigners criticising the company, and urged us all to engage with his colleagues, to share our concerns with them outside the context of the company AGM. Roger replied that Partizans had had very bad experiences of dialogue with the company in the 1980s and had consequently asked the company that such dialogue only be conducted in public, with an independent chair. The company had refused. Nonetheless, Roger had in fact sent the company, shortly after last year’s AGM, a report on its diamond project at Bunder in India, and had been promised a quick response – after which he had heard nothing. Jan du Plessis apologised for this, saying that he knew nothing of the report and that it was very bad manners on the part of the company not to have replied. And then there’s uranium. Note that several of the cases mentioned above involve uranium mining. But it’s not simply the fact that there happen to be problems with a few of the company’s uranium operations. Mining uranium not only creates radioactive contamination during the life of the mine: the mine itself, and the wastes created by the use of uranium in weaponry and power generation, remain deadly dangerous for hundreds of thousands of years, hundreds of times longer than the entire span of recorded human history. Why anyone should be convinced of the acceptability of this utter folly is a mystery to me. I can only assume that they have not studied late antique and early medieval European history, as I did: with the decay of the Roman Empire, a certain amount of technological know-how was lost. Even now, we only have the technology to make radioactive wastes safe for a temporary period. They need to be made infallibly safe for hundreds of thousands of years. What on earth gives people involved in the nuclear industry the confidence that generations to come will retain such knowledge as we currently have available? Notes of the question and answer session at the AGM are at Rio Tinto 2014 AGM notes. A webcast of the whole AGM is available on the company’s website at http://www.riotinto.com/media/webcasts-3611.aspx.